Although the Merced County Historical Society Museum displays history of the entire county in Merced’s old courthouse building, it is augmented by history museums in other communities throughout the county. Each town has its own story to tell and Atwater, Dos Palos, Gustine, Livingston, and Los Banos all have organized museums to tell these stories. Dos Palos’ Jail House Museum is located in the town’s old jail building at 2020 Almont Street. South of Highway 152, East of I-5, and west of Highway 99, Dos Palos is “off the beaten track” for most residents of Merced County. Founded in the 1890’s as a colony development named Colony Center, the name was officially changed to Dos Palos in 1906 – a place name that dates back to the first land grants issued in the area when California was still a part of Mexico. Dos Palos built one of the first high schools in Merced County (1907) and incorporated in 1935. Today it has a population of about 5,000 people. Like other small museums, it offers unique artifacts and glimpses into history that you won’t see in larger museums that tend to generalize history into broad trends and focus on the best-known and most influential historical characters. Comparison shots of downtown Dos Palos before and after the installation of streetlights. Nighttime was dark in a small town without them! The museum is open from 9AM to 12 noon on the second and fourth Saturdays of each month. To find the museum, exit south Highway 33 from Highway 152. Follow 33 to Almond Avenue and turn left. Look for the old jail on the left after you pass California Street. For more information about the museum you can call (209) 392-3064. 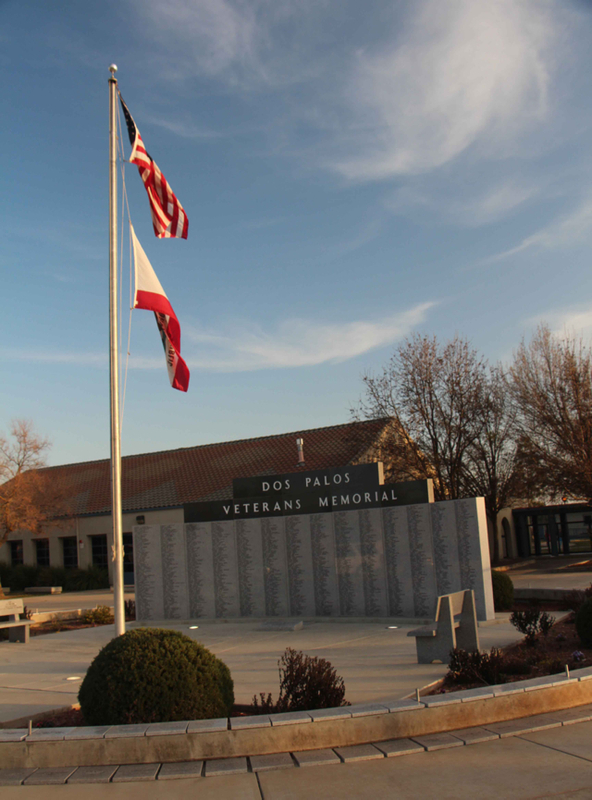 Dos Palos also has a veterans memorial located in front of Bernhard Marks Elementary School at 1717 Valeria Street.